Finland's pick for Eurovision, Lordi, and the national identity crisis it seems to have engendered, in The New York Times. They have eight-foot retractable latex Satan wings, sing hits like "Chainsaw Buffet" and blow up slabs of smoking meat on stage. 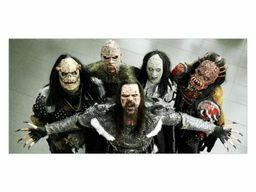 So members of the band Lordi expected a reaction when they beat a crooner of love ballads to represent Finland at the Eurovision song contest in Athens, the competition that was the springboard for Abba and Celine Dion. First, Finnish religious leaders warned that the Freddy Krueger look-alikes could inspire Satanic worship. Then critics called for President Tarja Halonen to use her constitutional powers to veto the band and nominate a traditional Finnish folk singer instead. Rumors even circulated that Lordi members were agents sent by President Vladimir V. Putin to destabilize Finland before a Russian coup — an explanation for their refusal to take off their freakish masks in public.